Faith Manyala is serving as a national UN Volunteer Child Protection Officer with the Child Protection Section of the United Nations Children's Fund (UNICEF) in Kenya. On Universal Children's Day, we share her reflections on her contribution to ensuring that every child in Kenya, especially vulnerable and disadvantaged children, as well as war-affected and displaced refugee children, live in dignity and have the right environment to pursue their dreams. 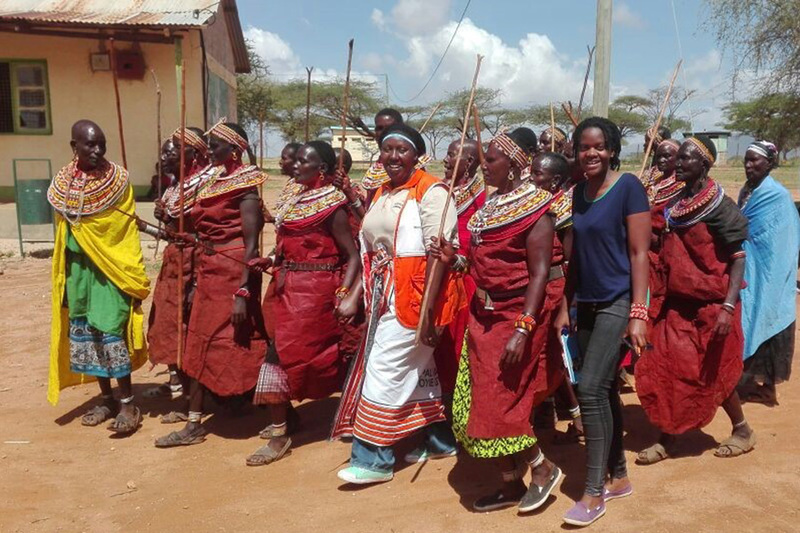 UN Volunteer Child Protection Officer with UNICEF, Faith Manyala (fourth from right), with women from Samburu community during a declaration ceremony to support the abandonment of female genital mutilation (FGM) in a bid to protect children from harmful cultural practices. I am a lawyer by profession but I have chosen to be a diplomat and an advocate for the rights of children. My passion to be a UN Volunteer is a motivation since it enables me to contribute towards making a difference in people’s life and most importantly to me, children. The United Nations Children’s Fund (UNICEF) provides humanitarian and developmental assistance to children and mothers in developing countries. As a UN Volunteer Child Protection Officer at UNICEF Kenya Country Office, I am contributing to ensuring that every child in Kenya, especially the vulnerable, disadvantaged, children as well as war-affected and displaced refugee children live in dignity and have the right environment to pursue their dreams. I find it sad when those who are entrusted to provide a safe and protective environment to children are the same ones who end up abusing or exploiting children. The Constitution of Kenya (2010) lays emphasis on the protection of all children. Further, the Sustainable Development Goals (SDGs) adopted in September 2015, include 11 goals directly relating to children. As a UN Volunteer Child Protection Officer, I work towards ensuring that boys and girls below the age of 18 are protected through strengthened child protection systems and the legislation and policies dealing with children are implemented. Faith Manyala, a lawyer by profession, is UN Volunteer Child Protection Officer serving with UNICEF in Kenya. My experience at UNICEF is life-changing as I continue to grow professionally, gain immense skills and build valuable networks. Through my contribution in giving inputs towards the Children’s Bill, I am looking forward to a country where all duty bearers starting from the parents, the government, institutions and other stakeholders are actively involved in protecting children by implementing the provisions of the Children’s Bill. In the words of Mark Twain, "20 years from now you will be more disappointed by the things that you didn’t do than by the things you did. So, throw off the bowlines, sail away from safe harbor. Catch the trade winds in your sail. Explore. Dream. Discover." These words summarize my great motivation to volunteer in ensuring that all children in Kenya, especially those who are affected by different emergencies are protected and can equally access protection services.